One of the unique things about Ketchikan is how you leave the airport. After collecting your luggage you proceed out the the front of the airport as usual. But instead of the usual bustle of shuttle vans, private vehicles, and taxis in front you find a tranquil drive with a few parked vehicles. Instead you and your fellow passengers file across the driveway and down a long boarding ramp and into a small ferry for the ride across Tongass Narrows. On the other side, at the ferry terminal, you find the crowd of vehicles you would have expected at the airport. The ferry runs every half hour and costs $6 for the ride. While unique, it does add a fair amount of time to the process of de-planing your aircraft and getting on your way to the final destination. Pick-up by float plane or small craft can be accommodated at a small dock on the airport side just north of the ferry terminal. I suppose it is an improvement on the original airport. Before the opening of the Ketchikan airport in 1973, passengers would arrive at the Annette Island Airport 20 miles south and take a shuttle boat or floatplane to Ketchikan. The ferry was to have been replaced by a bridge a couple decades back, but the funding drew a storm of controversy in the US congress. As the planned bridge was large enough to cross the channel with the needed clearance for cruise ships to pass underneath it would have been big. Thus the budget was a few hundred million dollars. The city of Ketchikan was caught in the controversy over federal budgets and earmarks, with the bridge derisively labeled the “Bridge to Nowhere” and used as a symbol of pork barrel spending. 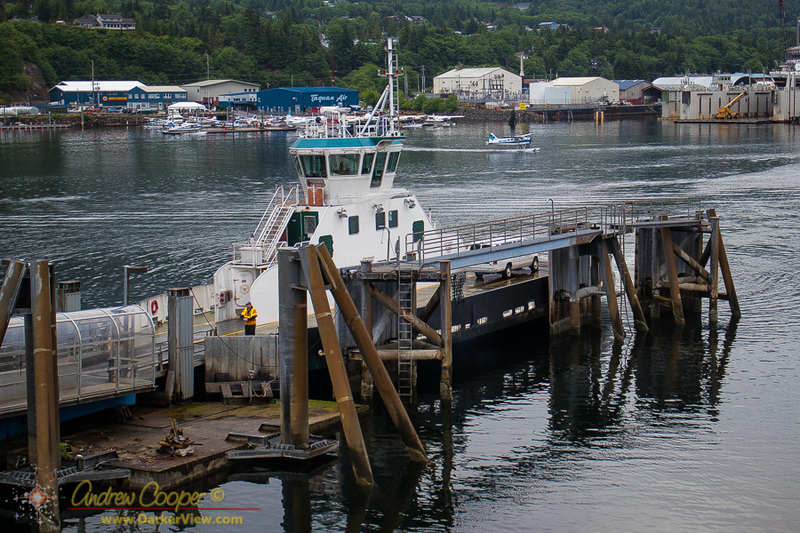 As a result the funding was eventually pulled and the airport ferry remains a fixture of life in Ketchikan. An electrical engineer living and working on Mauna Kea, Hawai'i. Webmaster for the NordicQuest.com website. Sometimes the first mate/deckhand/launch driver/anchor detail/cook/dishwasher and mechanic aboard the Nordic Quest. This entry was posted in Alaskan History, Travel Hints and tagged airport, ferry, Ketchikan. Bookmark the permalink.